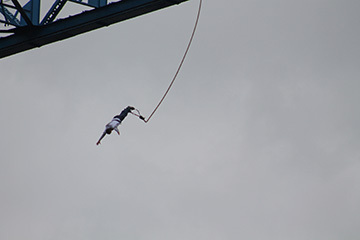 Steve Wintrip jumps from Transporter Bridge in Middlesborough to raise money for very special children. Steve raised over £800 thank you so much, so brave so so mad. Bradley Burn Farm and Coffee Shop are holding a Christmas Fayre on Saturday 6th December 12noon – 6pm. Gifts, cards, cakes, hampers, raffle, cheese, mince pies and mulled wine. should be a lovely festive treat and they are raising money for Tabithastoys too. Eat Cake and Donate – Imogen and Gavin raised £275 at their coffee morning at The Duke of York, Fir Tree, Crook, Co Durham. well done great cakes and lots of money thanks to all who came. Our AGM will be held at 11.15am on Tuesday 29th August at the Duke of York pub, Fir Tree, Co Durham. All are welcome. Hannah Day raised £500 with her race night at Woodham Community Centre. A great night was had by all, well done Hannah. 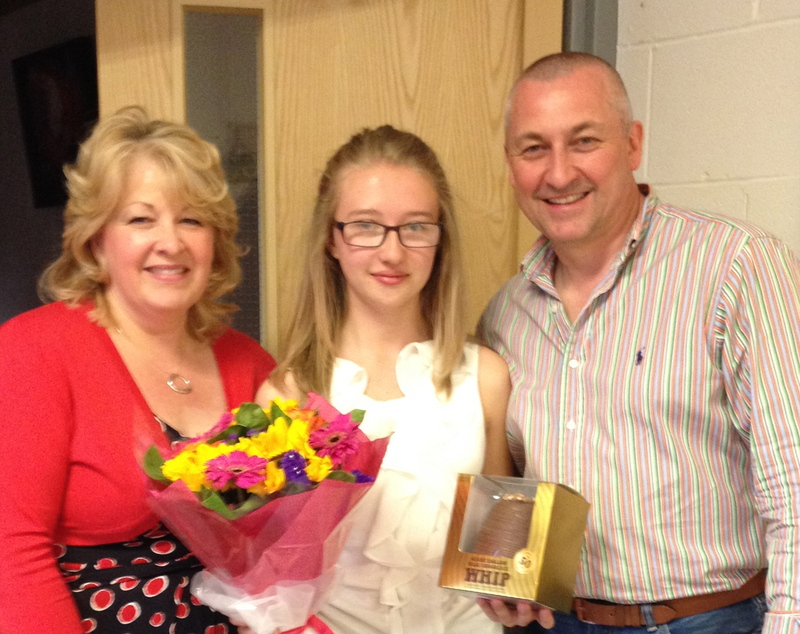 A great big thank you to Hannah and all her family and friends for their help and generosity. Lea McKimm has raised £30 for Tabitha’s Toys she cycled 20 miles with the help of her friends and parents. Thank you Lea. Hannah Day and Family are organising a fund raising Race Night at Woodham Community Centre, Newton Aycliffe Co Durham on Friday 20th June. Doors open at 7, first race at 7.30. Adults £5, children £2.50 includes pie and peas. Bring your own drink, alcohol allowed. Please see Hannah’s Facebook comments for information about tickets as she needs to order food in advance. Thanks Hannah. Boxing day dip – Benfield Nissan Gateshead: Ed Curran, Barry,Davis,Paul and Steve Jacques,John and Christine Sayer, Lorraine Harrison and Joanne Drummond were all wet and very cold raising over £1700. 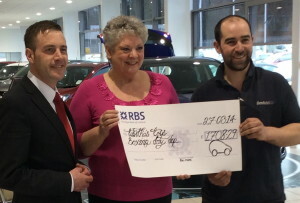 Christine receives a cheque from Ed Curran and Barry Jacques for £1708.29. Thanks to all involved. 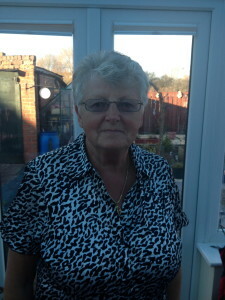 This is Jean Great Grandma to Luke one of the very special children who use our charity. Jean has recently celebrated her 70th birthday. 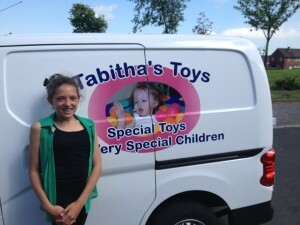 Instead of flowers and presents she asked her family and friends for donations to Tabitha’s Toys which was £560. What a wonderful generous thing to do and we really appreciate it. Thank you so much, Jean. 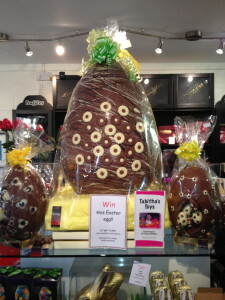 Truffles Chocolate Shop in the Dales Centre Stanhope has a hugh chocolate Easter Eggs the biggest we have ever seen. 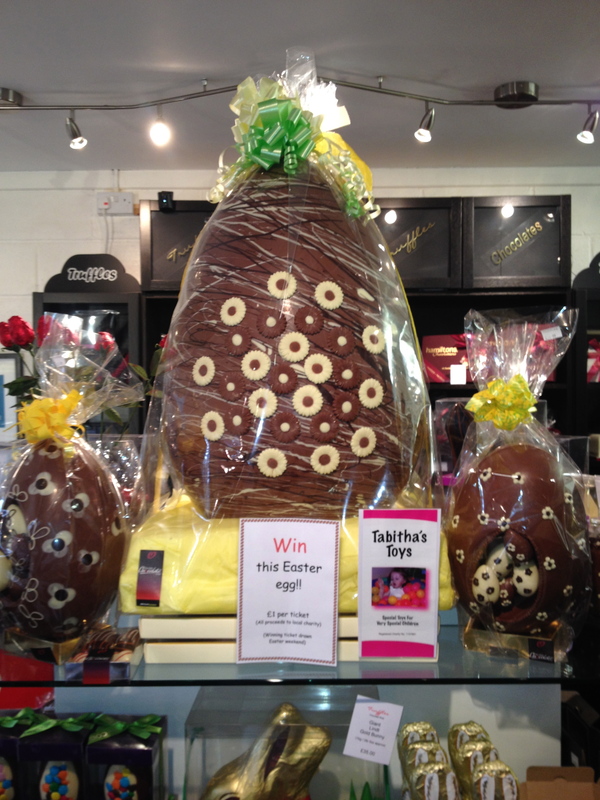 Truffles is raffling the egg to raise funds for Tabitha’s Toys @ £1 per strip. Thanks to Frank and staff. 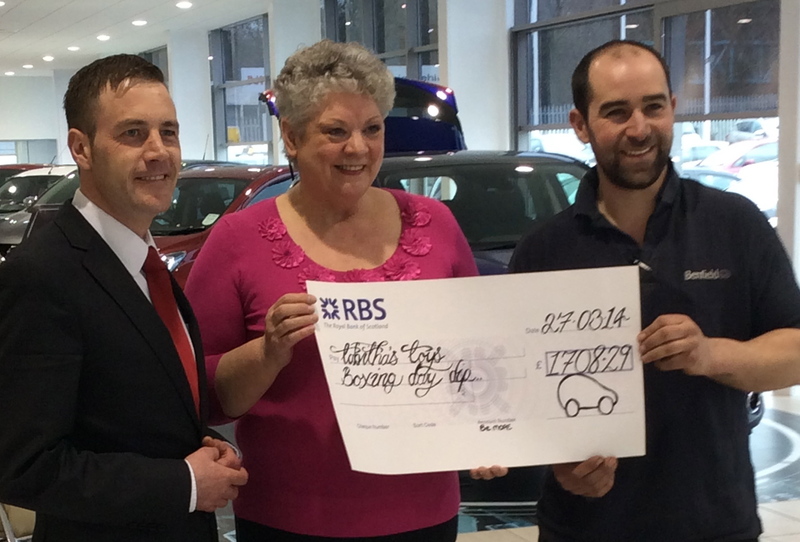 Ellen and Bob have raised £1300 on behalf of Mark and Ashley’s little boy Lewis. 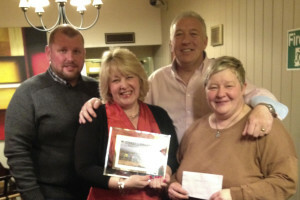 They had a race night, Karaoke, disco and raffles at Grange Villa Club and The Top House Pelton. 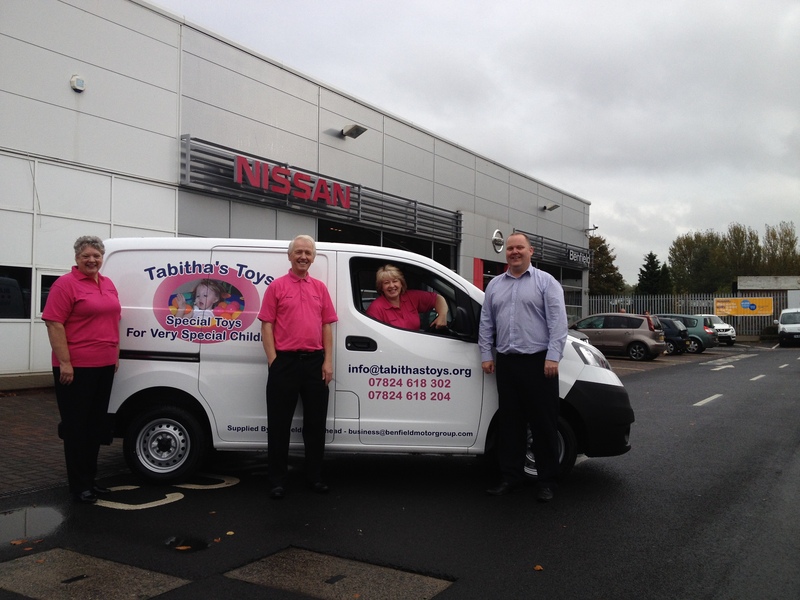 A great big thank you to Ellen and Bob and all their family and friends for all at Tabitha’s Toys. Jacqueline receives a cheque for £500 from Neil Edgar and colleagues, Durham Constabulary from their Coast to Coast bike ride. 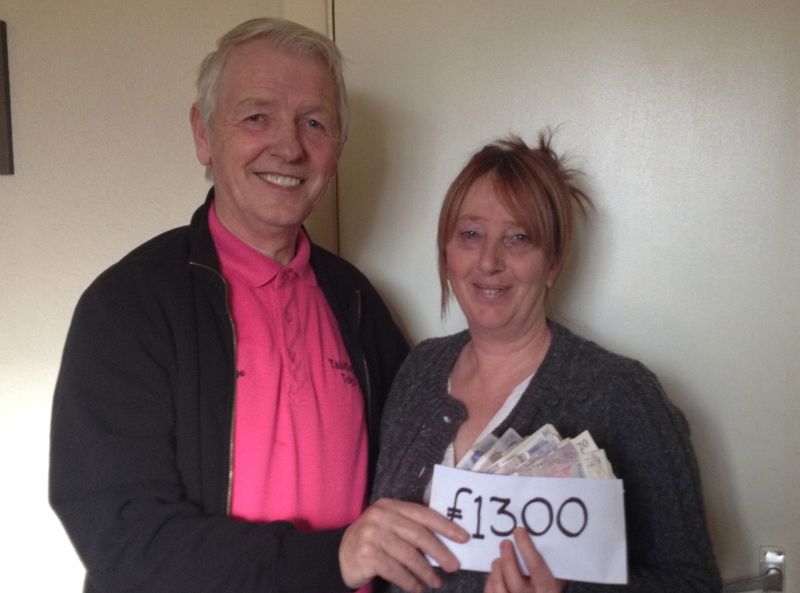 Dave Rooney and Helen Pearson of Durham Constabulary present £200 from their Christmas event. Thanks to all involved. 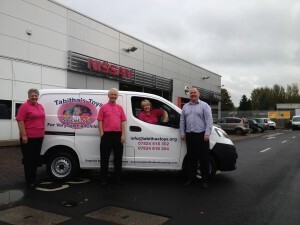 With the help of Nissan, Benfield Gateshead and BBC Children in Need we collected our new van today. Well done to Imogen,Gavin and staff they raised £256 at their coffee morning. A great big thank you. 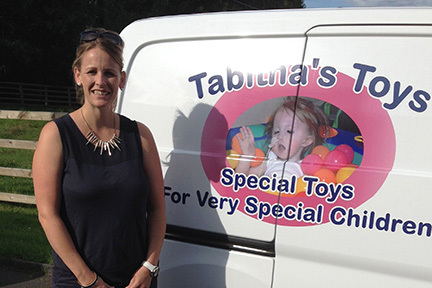 GOOD LUCK to Andy Boyd, Darren Phillips and Neil Edgar who tomorrow are cycling the coast to coast route in aid of Tabitha’s Toys and the Anthony Nolan Trust. THANK YOU boys. 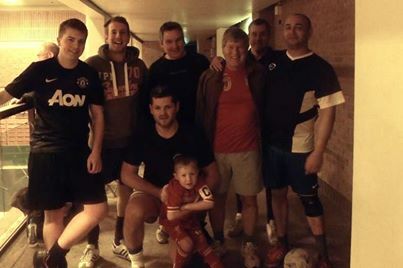 Please sponsor the guys.